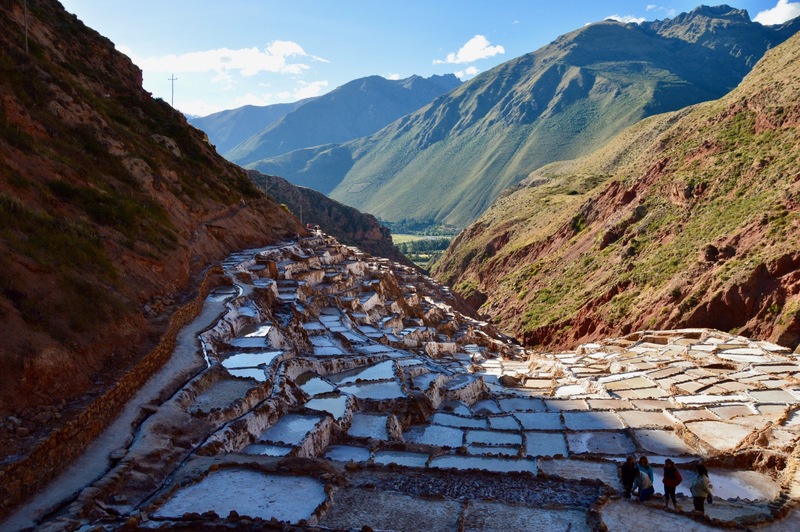 Peruvian Culinary Heritage, as well as recent innovations there, are influencing food scenes around the world. 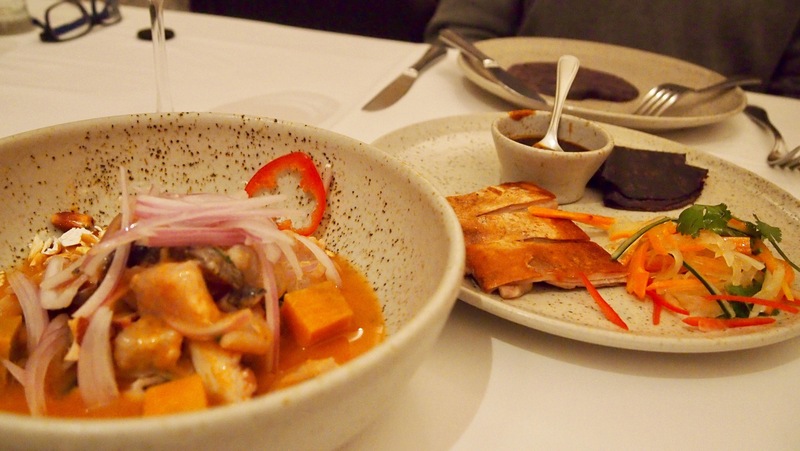 “Lonely Planet – Food Trails” describes this heritage so well “In Peru, criollo cooking is the fusion of native ingredients with the disparate cooking style of conquerors, slaves and immigrants”. 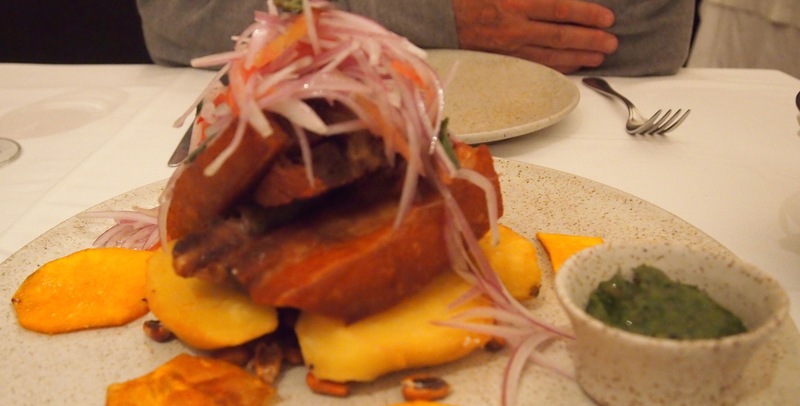 Our 2 months in South America (May-June 2015) included Chile, Argentina, Brazil and finally Peru where we slowed the pace for plenty of wining and dining, especially in the world recognised “Capital of Cuisine” – Lima. Transport between destinations was mostly by train, plane and car/van (with drivers) – see photos at end of this post. 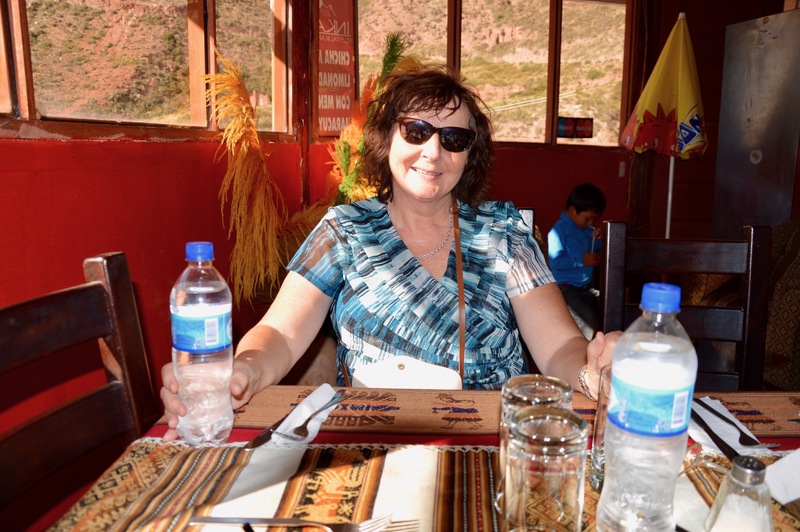 Before we arrived in Lima (our final stay before heading home to Sydney) we had many other wonderful experiences…cooking, learning, eating, drinking, socialising – all lots of fun! 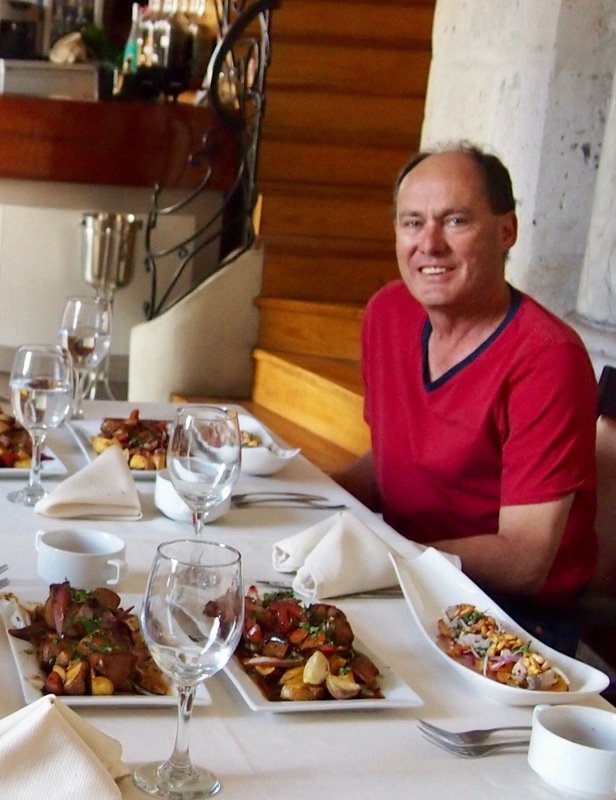 A cooking class highlight was in AREQUIPA – “Peruvian Flavours Cooking Class” with Chef Arthur. It’s a very popular class so it’s worth booking well in advance. On checking today on Trip Advisor, I note that he has 107 “excellent” reviews and 5 “very good”. I usually review places that we love but on returning home, we were very busy selling/moving out of our family home – a downsize now our sons are adults + we’re travelling more. If I had done a review (too late now of course! ), I would have rated it “excellent” too. 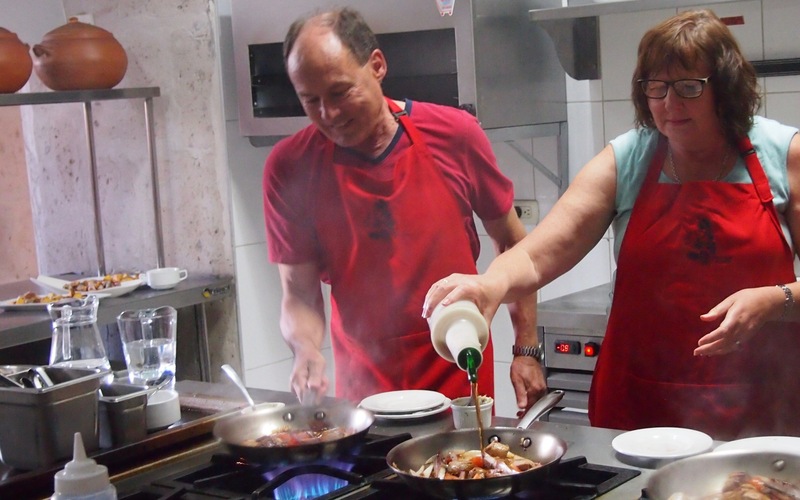 It’s located within the Old Town area so we walked from the main square – the classes were held in a kitchen/dining area within a small hotel. When we asked about the cooking class location at hotel reception it was the only place in South America where we were greeted with rudeness, even though I cheerfully greeted the receptionist with Buenos Dias…he yelled “speak Spanish!”; maybe it was because we weren’t staying at the hotel. So it was a relief when, shortly after, Chef Arthur appeared in the lobby to greet us in his warm and friendly manner! His English is excellent and explanations etc. are very clear and informative. If you enjoy cooking (&/or eating!) a highly recommended class! 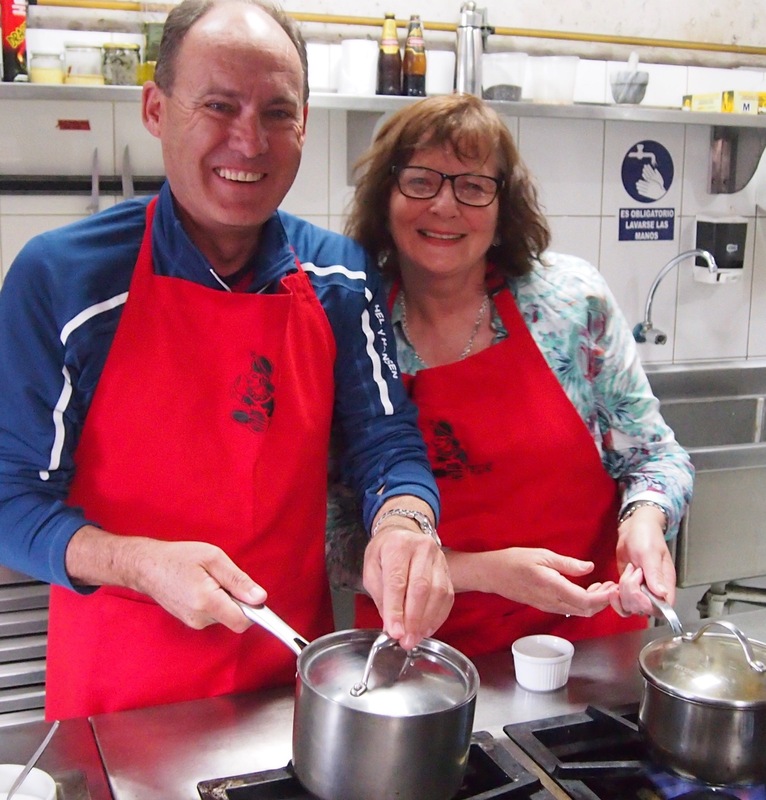 Our 1st photo (feature 1 on this post) always makes us laugh because my self talk is..”oh no, I’m next to do that!” To save embarrassing myself, I won’t post the photo of my attempt at flambé – I look quite crazy with the fire reflecting in my glasses! However, I did survive the experience with no burns and a nicely cooked “Lomo Saltado De Alpaca” 😉 (we substitute beef or lamb at home). 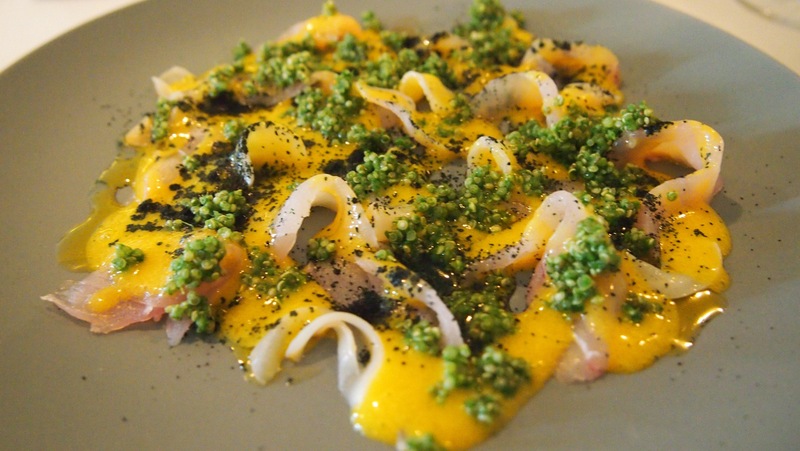 The other dish we made was a traditional Ceviche. 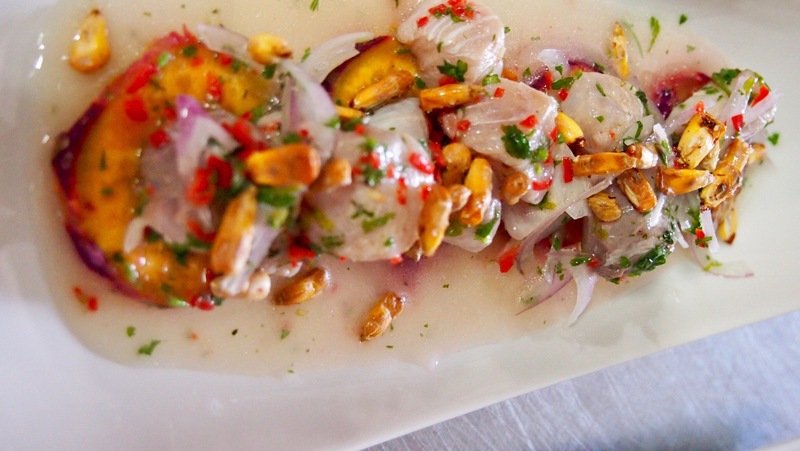 Recipe for Ceviche below…we grilled fresh corn on the BBQ as we haven’t been able to find the dried corn used in Peru. I’ll post a map soon showing distances from Lima and other places that are great to visit. Photo above: Ceviche plate we made – it was a perfect combination of fresh fish marinated in lime juice and chilli pepper plus we loved the addition of the traditional dried corn. The dried corn created a combination of flavours and textures that we hadn’t tried before. It’s worth spending a few days in the beautiful city of Arequipa including the markets as well as the many restaurants and cafes. 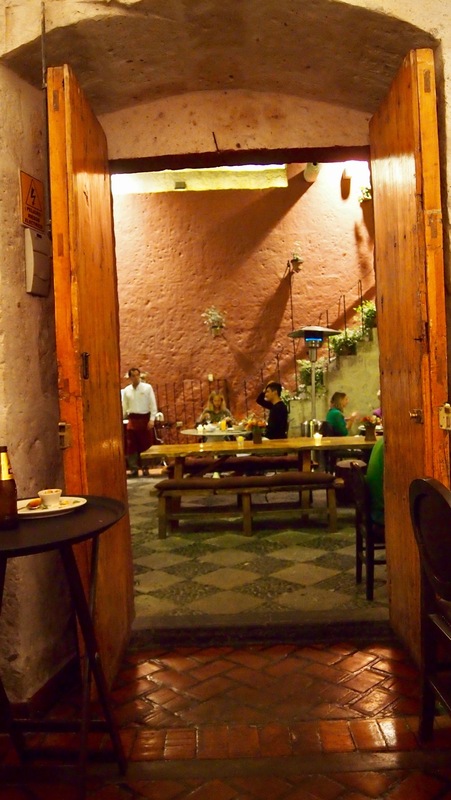 The historic centre of Arequipa has many Spanish Colonial mansions (some dating back to the 15th Century), with internal courtyards which have been converted from private residences into upmarket shops, small art galleries, cafes and restaurants. 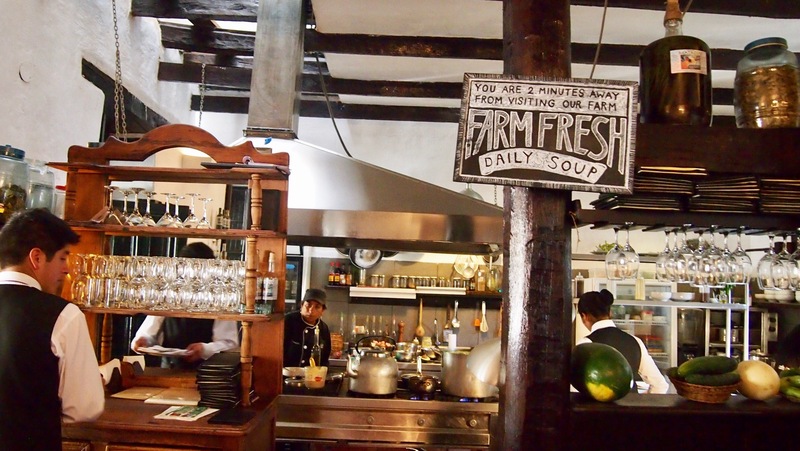 The photo above is of a restaurant located in one of the historic buildings – we particularly loved this one. 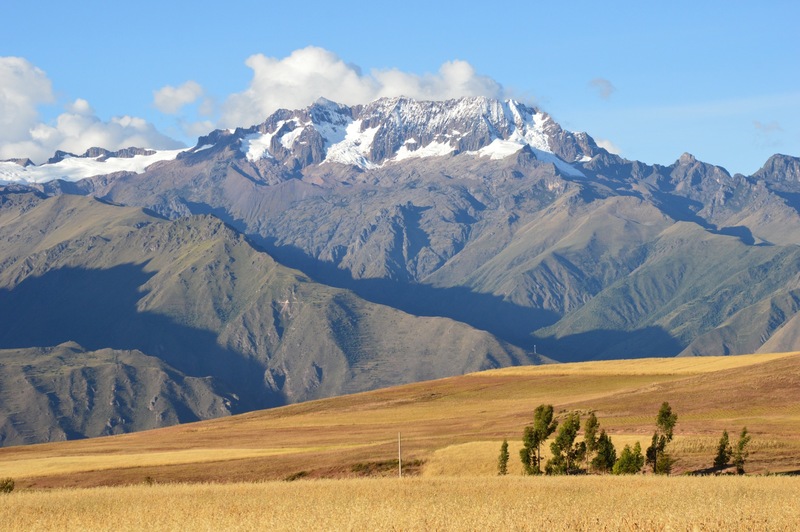 More photos and information on Arequipa will be added to my previous Peru post highlighting Machu Picchu. 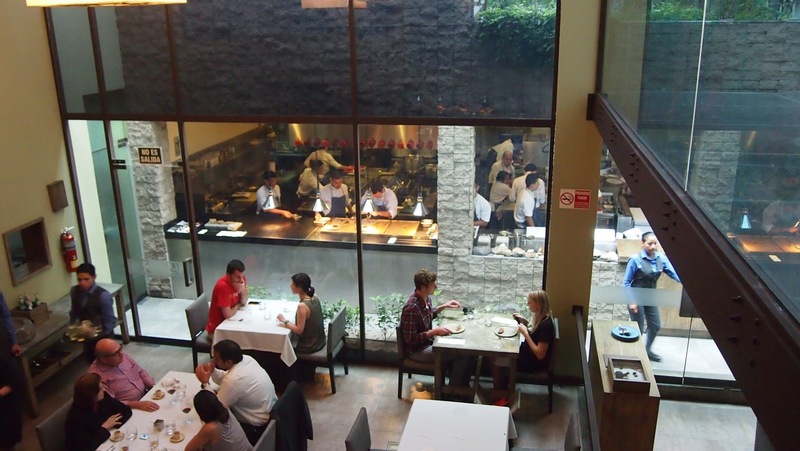 As can be seen in the photo, we were sitting at a higher level in this very modern restaurant; however, the foods they serve are a combination of both modern innovation (where everything works so well…they were ranked No 4 Restaurant in the world at the time of our visit), Andrean cuisine plus ancient Peruvian foods such as “native potatoes served in edible clay”. The clay had an earthy/nutty flavour – very tasty! We also loved their pickled vegetables which came as a small side with our seafood. Our starter was a Ceviche (see photo below). There is also a rooftop herb garden – we didn’t ask to go up there…maybe next time if we’re lucky enough to return! We booked well in advance and we still couldn’t get a reservation for dinner so we went for lunch instead. In 2015 Well priced fine dining compared to similar restaurants in Europe, Australia, NZ, America, UK and Canada – and probably other continents we haven’t been to YET!…eg. Sth Africa (our next trip). This week’s Canberra Times had a piece about up and coming local chefs – they mentioned Central and the head chef, Virgilio Martinez as an inspiration. 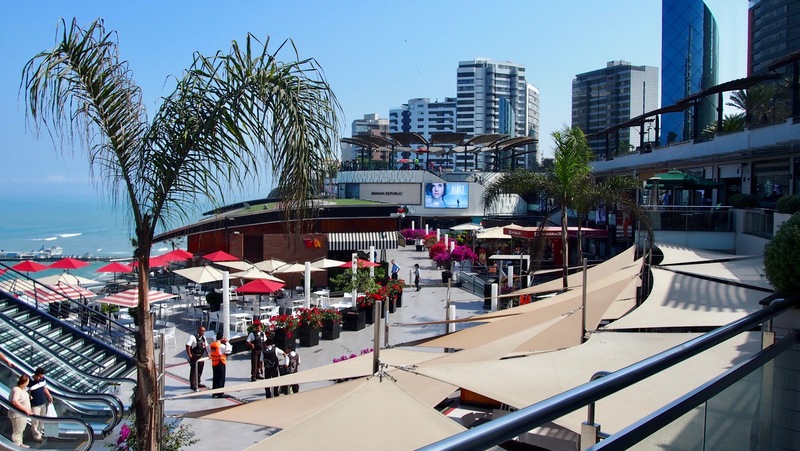 Within the complex above there are a range of cafes and restaurants – fast food, casual and more formal dining. The photo below is of a mid price range casual restaurant that we went to for a light lunch. We enjoyed it. After lunch we walked along the waterfront – there’s a long path with interesting sculptures and gardens to see. 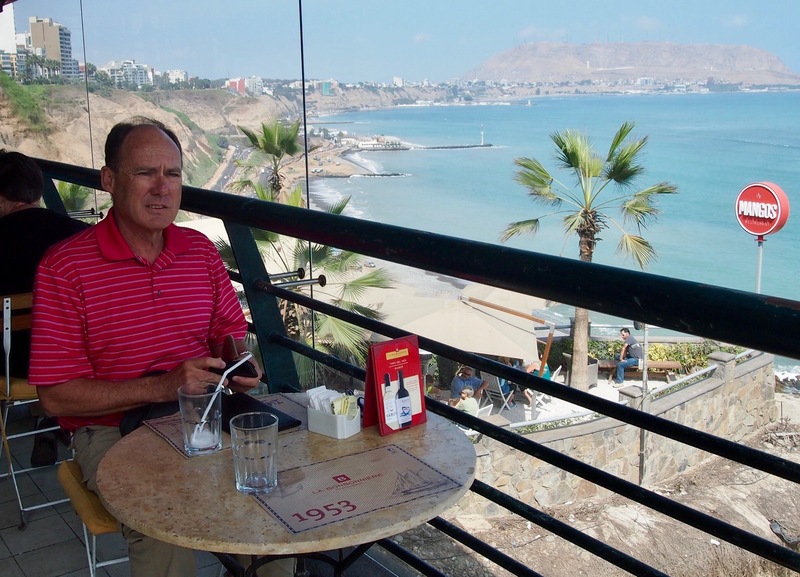 A memorable day/stay in Lima! This was the view from the little restaurant that can be seen in photo of me above. It was a late lunch so the light gave a warm glow which shows up in this photo too. After lunch Tony walked right along the narrow path to see the view of the mountains in the distance – my bad back had been bothering me so I stayed near the restaurant & played around with the camera. Of course the Quinoa and Veg soup was once again on the menu (see sign in photo above)! 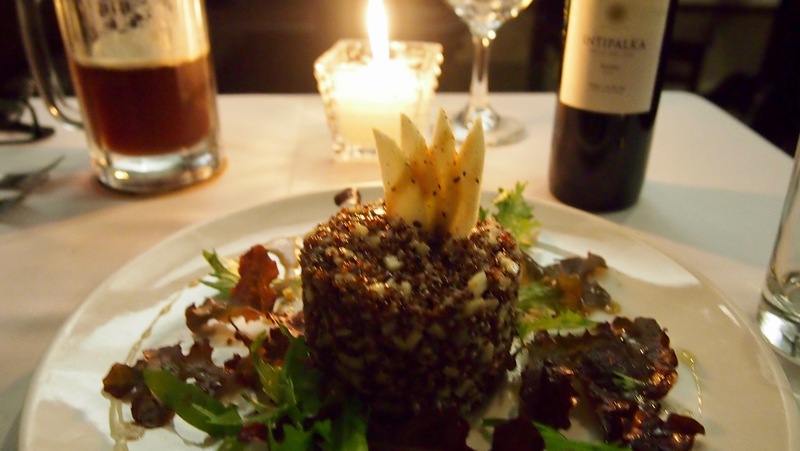 There were other soup choices as well plus lots of other interesting and tasty plates such as the purple quinoa and apple salad which can be seen in the photo below. We had a beautiful chicken dish to accompany this salad but it wasn’t as photogenic as the salad; however very tender and tasty!